Park Hill players, including Andrew Hrisak, No. 3, celebrate getting the Class 4 District 16 plaque on Thursday, Nov. 1 after beating Park Hill South, 2-1. One by one, Park Hill soccer coach Josh Marchbank accepted congratulations from Trojan supporters. Parents, friends and family alike embraced the six-year head coach of the Trojans as Marchbank’s players took in an historic victory Thursday night in front of the east goal at the soccer field at Park Hill South. The excitement surrounding the Park Hill soccer program in this moment was warranted. To the Trojan faithful, success at the district tournament was overdue. And on this night, Park Hill’s seven-year absence from the MSHSAA soccer tournament came to an end with a dramatic victory over rival Park Hill South. 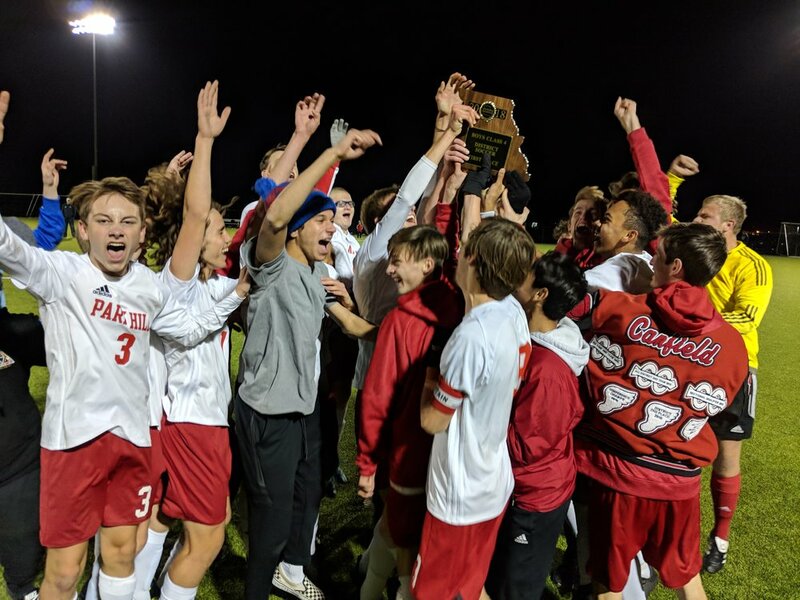 Behind Jackson Austin’s game-winner in the 67th minute, the third-seeded Trojans came from behind to defeat the top-seeded Panthers 2-1 in the Class 4 District 16 title match. It’s the Trojans’ first district championship since 2011. Park Hill’s win was its second in eight days over South. The Trojans won after seven rounds of penalty kicks in the regular-season finale before once again topping the Panthers in the district title contest, reversing South’s run of dominance in the rivalry. Before this season, the Panthers had a firm hold on the series, winning all meetings since the Trojans last won in 2013. The Panthers, who were searching for their first district crown since they beat the Trojans in the 2012 title game, finished the season with a 16-6 record. Meeting in the district tourney for the first time since 2012, the Trojans and Panthers were locked in a defensive battle in the first half. Each side saw minimal chances in 40 minutes of scoreless soccer. Five minutes into the second half, however, South drew first blood when senior forward Carson Lindsey trickled a shot past Park Hill senior keeper Stefan Derra that hit the post, but the ball rebounded back to Lindsey’s foot, and he buried the putback attempt to put the Panthers ahead 1-0. A one-goal deficit was the least of Marchbank’s worries. The Trojans answered in the 60th minute off a corner kick. Junior forward Matthew Lachowitzer finished a tussle for the ball in front of the face of goal at the back post with a flick of his head, placing the equalizer just past South senior keeper Mark Allred. Then, seven minutes later, Austin struck with a header of his own, directing the ball down to the turf before watching his eventual game-winner bounce out of Allred’s reach and into the top netting, sending Austin to the other side of the stadium for a knee slide celebration in front of South’s student section. “To run straight over to them, I’ve never had the opportunity to do that,” Austin said. “That celebration is just iconic and a classic one. And this was an iconic moment for us as a program. It just felt right. The Trojans held off the Panthers in the final 13 minutes to secure a trip to the state sectional round. Park Hill (14-9), winners of six straight, hosted District 15 champion Liberty North (13-11) at 6 p.m. Tuesday with a chance to match the program’s 2011 quarterfinal appearance. Results were not available by press time. The Panthers bested their conference rival on Tuesday, Oct. 30 in the opening round of the district tournament. Park Hill South scored twice in the opening five minutes and three of its seven shots the team took in the first 40 minutes found the back of the net against the Indians. Moti Sarbessa scored in the 2nd minute — on a pass from Cole Bromstedt — and Carson Lindsey scored in the 5th minute. Austin Gates provided the assist on that one and added his own goal in the 32nd minute. Up 3-0 at the break, the final two goals were five minutes apart. Jacob Garza scored in the 53rd minute and Chris Brock scored in the 58th. Central was held without a shot on goal in the loss. The other district semifinal on Tuesday, Oct. 30, saw Jack Austin kick the game-winner on a penalty kick in the 74th minute. His shot went to the right of the Hornets’ goalkeeper and snuck inside the right post for the only tally in the game. Gabe Smith posted a shutout for the Trojans.